We love our readers and fans! Here's where we get a chance to show it! 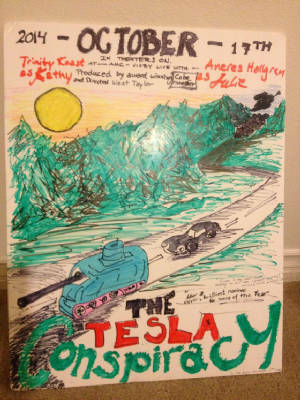 Here is our first Fan Art from a 9-year-old reader, who made a movie poster based upon The Tesla Conspiracy novel as part of a school book report! Good Job! Here are some of our reader's reviews posted on Amazon.com! Thank you! “While it's true that the lightning and government stencil font on the cover of the book does imply a faster-paced introduction, the author does not disappoint with this intrinsically captivating novel [rooted in historical accuracy]. Starting off with a brief but promising prequel, we're injected into a violent and detestable world where sinister forces usurp even the highest branches of our nation. Although Finley promises action, it's true that the next act in this composition has a slower pace of revelation than its predecessor. I promise you, that through the necessary relation of facts and fiction, Finley will immerse you into a world of science and shadows that teems with cogency, validity, and suspense that will leave your palms sweating and your head racing. This fictional episode seems almost factual; the old-fashioned American values, heartfelt friendships, and perseverance in the eve of imminent destruction make every page seem more enthralling than the most vivid dreams and nightmares we've canvassed in our lifetimes.